Once Allies complete our program, they are forever part of the Public Allies family. 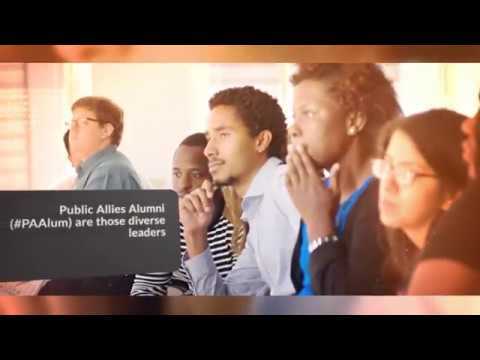 Our Alumni Programs connect and engage the growing Public Allies network of diverse leaders, providing support for graduates’ career development, influence, impact, and civic engagement. We help advance #PAAlum into nonprofit and public leadership roles so that they can put Public Allies’ values into practice, enabling their communities to more effectively address social issues and move toward greater equity and justice. Public Allies believes that social sector leadership should be representative of the communities they serve. As values-based nonprofit professionals, philanthropists, board members, and artists, #PAAlum are those leaders. Our #PAAlum are diverse, social sector leaders. Of all 8,000 #PAAlum, 80% are people of color, over half are women, and the majority are from low- and moderate-income families and underserved communities. Our #PAAlum are changing the face and the practice of leadership, with 80% pursuing careers in the social sector and 45% aspiring to become a social sector CEO or top executive. The next generation of leaders needs to look like America will look, but at the same time, nonprofits are struggling to recruit and retain diverse talent. People of color represent only 18% of overall nonprofit staff members and only 11% of nonprofit CEOs. Our 2016 report, “Advancing Diversity in the Nonprofit Sector,” found that most #PAAlum work in organizations with no mention of diversity in their mission statement and no staff persons dedicated to that work. Abel Núñez (Washington DC, ’95) was the first person in his family to speak English, and as a result, from a very early age he was often asked to translate for his family. Fast-forward decades later, and Abel — who arrived in the U.S. with his family from El Salvador in 1979 — continues to be a vital bridge between recent immigrants and the larger community. For his work, including rising up to become executive director of CARECEN, an immigrant rights group in Washington, D.C., Abel was recently awarded Georgetown University’s John Thompson Jr. Legacy of a Dream Award at the John F. Kennedy Center for the Performing Arts. How do I access my AmeriCorps Education Award? Your Education Award is managed from this AmeriCorps page. You can find more information about using Education Awards here. How can I connect with other #PAAlum? You can connect with other #PAAlum at our LinkedIn Group, or our #PAAlum Pulse Facebook Group. How can I connect with my local Public Allies site? Go to our map and click on your site for local contact information. How can I share my leadership story with Public Allies? We want to celebrate our #PAAlum who are working to build a just and equitable society, and the diverse leadership to sustain it. Fill out this quick #PAAlum survey to let us know what you’re up to. Can you help me get a new job? We’re committed to building a just and equitable society and diverse leadership to sustain it, and we want to move our #PAAlums into roles that advance that mission. Your first step – complete this quick #PAAlum survey to let us know how we could best support you. PLEASE READ CAREFULLY THROUGH OUR WEBSITE WHICH WILL ANSWER MANY OF YOUR QUESTIONS. FOR QUICKEST RESPONSE TO ADDITIONAL QUESTIONS FIRST TRY TO CONTACT THE SITE YOU ARE INTERESTED BY CLICKING ON OUR INTERACTIVE MAP. Chicago, Milwaukee, New York, Washington, D.C.
Not only does it take dedicated volunteers and passionate staff to keep our doors open, but it also takes donations from people like you. DONATE HERE to support our mission for a just and equitable society and the diverse leadership to sustain it. Learn more about applying for an Ally position in one of our 25 locations nationwide by CLICKING HERE.